John E. Fullerton, Inc. provides telecommunications and data network cabling services to commercial and industrial clients throughout central Pennsylvania. Whether you are seeking to upgrade your existing network, move to a new location, transition to a new VOIP telephone system, or to enhance your existing communication network, our data cable contractors of Lancaster, PA want to hear from you. John E. Fullerton, Inc. has the knowledge and experience to help design and engineer a network that meets your needs today and into the future. 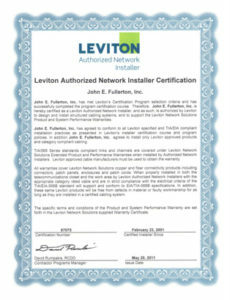 For additional peace of mind, we are a Hubbell Certified Installer with the ability to provide the Hubbell Mission Critical Warranty, and we have been a Leviton Strategic Partner Program Member as well as a Leviton Authorized Network Installer, certified since 2001.